A Banner Flag over there tells people you're over here. Want to WOW the crowd and get their attention? 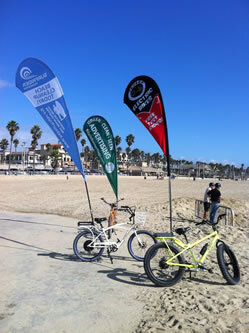 Then get your bike, one of our Bicycle Banner Flags and ride, ride, ride! Best of all, with our Bicycle Banner Flags and our proprietary assembly kit you will be able to advertise your business, products or services in a fun, healthy, green and affordable way. Not only is this fun advertising, it's very easy to do and terrifically effective. Plus, this is the most economical marketing idea on the streets to date. Anywhere a bicycle can ride, your business can promote its message. Imagine your business message being seen by everyone on the street any day, anytime, anywhere you choose. 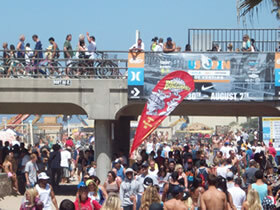 As you ride and fly your Bicycle Banner Flag, people will be watching and noticing your message. You can then easily talk to and engage prospective customers while handing out informational brochures, business cards or giveaways. Contact us today and get your business message riding and flying with your own Bicycle Banner Flag. Mobile so your business can be mobile. Economical and do not expire; useable everyday. Visible above all other mobile promotional pedal vehicles. Healthy for the environment and for your image.